To me, it doesn’t feel like Virginia Wine Month without closing it out at Barboursville Vineyards, where today they hosted their semi-annual Vertical Tasting. For $40, you get to taste four flights of a single wine going back several years, or decades. 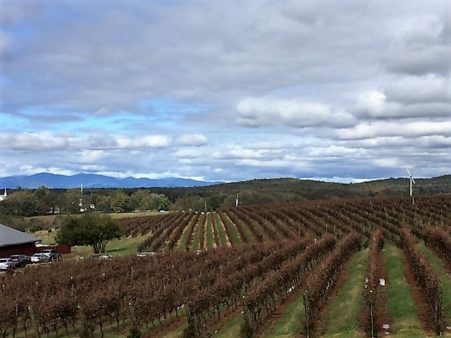 It’s highly educational, especially for a young wine region like Virginia, to taste the evolution of single varietals, or proprietary blends from the same property over the years. Luca Paschina, Barboursville Vineyards General Manager since 1991, believes in the value of holding back wine and releasing it as “library” wine, just for the value of this educational experience. Those in the trade as well as consumers can learn a lot about the evolution of fine Virginia red wine from young to mature character, where their own taste preferences lie, and encourage them to develop the patience to lay down the kinds of wines they like, for their own preferred time period. 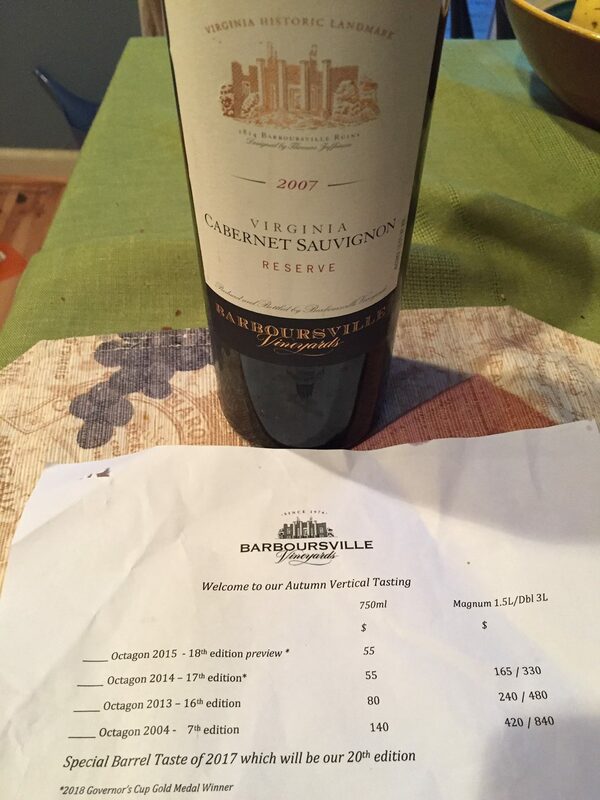 For example, last night I opened a 2007 Barboursville Cabernet Sauvignon Reserve, and at 11 years it was mature, multi-dimensional and elegant, but could clearly develop for another four or five years. It was a pleasure to meet old friends at the tasting, and even some new ones. To the winery’s credit, they do sell bottles of the reserve wines they feature on their tasting menu, and prices are reasonable. I was very impressed with the Cabernet Franc 2014, and thought the $35 price was fair for a library vintage of this quality. Nose: spicy black cherry and black olive with leafy herbs. Palate: chewy, with huge spice and pepper, red and black cherry. Huge dimension, a good showcase for the potential of aging Virginia cabernet franc. Nose: bright fresh red cherry. Palate: elegant, smooth tannins, flavors still unevolved, still young, promising. Nose: some bell pepper, also on the palate, with black pepper and black cherry. Flavors still close, needs time but lots of potential. Best from eight to ten years old. Nose: Faint spicy cherry. Palate: well-knit, solid black cherry fruit and long lasting, solid tannins. Fine varietal character, but needs four to five more years. Nose: stylish, with cedar spice and cassis. Palate: great integration of fruit and tannins. Elegant, can drink well in a year but last a decade. *Cabernet Sauvignon Reserve 2010: Solid dark ruby color. Nose: dense and complex with red cassis, black olive and baking spices. Palate: chewy tannins, still dumb, needs more time (like most 2010 VA reds). Try again in two to four years. Cabernet Sauvignon Reserve 2005: Nose: Amazing Bordeaux character; graphite, spicy red cassis, and cedar. On the palate, crisp and short, with nice cedar, spice and cassis notes. At its peak. The best way to do the Barboursville Vertical Tasting is to follow their lead from Cabernet Franc to Nebbiolo to Cabernet Sauvignon, then stock up on fine cheese, charcuterie and bread, then go (with your jacket) into the Octagon Cellar to taste the flight of vertical wines there. The entire experience is worthwhile but left me with feeling like the idea of the blend, especially with Virginia’s wildly variable climate, is the smart way to go with building a wine and a reputation for finesse and elegance, meaning Octagon. As I explained in Beyond Jefferson’s Vines, Luca brings the wisdom of the Old World to Virginia terroir. Looking at our clay-heavy soils and track record for the red grapes which performed most consistently over time (Cabernet Franc and Merlot), he became convinced that a “Right Bank” (Bordeaux) style blend was the model to follow in Central Virginia, and thus Octagon began, and has followed a largely Right Bank style (roughly 60% Merlot) every year (not each vintage is declared for Octagon…but I understand there will be one in 2018!). Other components usually focus on Cabernet Franc and Petit Verdot, with Cabernet Sauvignon usually as a minor component. That being said, the 2004 Octagon was elegant, holding well with dark cherry and plum and floral notes, with herbs. On the palate, it revealed some olive, herbs and solid black fruits with firm yet elegant tannins. Holding well, this mature wine is elegant with a fine smooth texture and can still hold awhile more. *Octagon 2013: Nose is nicely mature, with dark fruit, plum and cherry, with some spice. On the palate, there is lovely black fruit concentration, with fine smooth tannins and spice. Yummy now but still young; worth waiting another few years. *Octagon 2014: Nose: Brooding dark fruits, a bit closed but clean black fruits. Palate: spicy, smooth and bright black fruits, ripe smooth but lively tannins. Will age well but could drink in a year with decanting. **Octagon 2017: I’m very glad Luca decided to put in this (blend component of a not-yet finished wine), to get us all excited about what to expect from this fabulous vintage! I actually prefer this partial-blend barrel sample to the 2010 (the last previous great vintage), because it is more balanced with better acidity. It has very forward blackberry-like fruit with ripe, smooth and lively tannins. Will age well but could drink young (with decanting). Forward, fresh and lively (disclaimer: not a representative of the final blend). Follow Luca’s advice: lay down some fine Virginia wine and hold for a few years. I was richly rewarded with the elegant Barboursville Cabernet Sauvignon 2007 (see photo). Even at 11 years old and nicely mature, it could still age for a few more years. I have followed your recommendations for other 2 & 3* wines. As I went back to re-read this entry, I was intrigued to see your notes for the ’14 Octagon as only a 1* review. Thanks for sharing your enhanced perspectives on the BBV wines! Thanks for your comment! You may have seen this but you can subscribe to my blog now by filling out the widget at the top of the blog page on the right. To answer your question, I found the 2014 Octagon fine and elegant but still young, needing (ideally) another year to reach its peak. At that time, and with decanting, it could go to two or even three asterixes. It certainly has the potential. I hope you find some good Virginia wines for Thanksgiving in my latest post! My husband and I bought a bottle of the 2004 Octagon many, many years ago when visiting the area. We decided to put it away for our 10th wedding anniversary, however, we forgot about it and now our 13th anniversary is fast approaching. We are wondering, should we open it for our anniversary this month or, let it age another year or two? Based on my notes from tasting the 2004 Octagon at the winery in October, you’re in luck! I think the wine is perfectly mature. You’ll want to decant the wine wine slowly into a pitcher, or carafe, about 15 minutes before sitting down with it. On paper you could wait another 2 years but I think you should go ahead and enjoy it now!